10. The Countess of Wessex wore fairly simple jewelry -- earrings, a pendant necklace, and a bracelet -- at a reception hosted by the Diamond Jubilee Trust in honor of the Queen's big milestone achievement on Wednesday. 9. Princess Caroline of Monaco dressed casually to watch her daughter, Princess Alexandra of Hanover, skate in an ISU Junior Grand Prix event in Linz on Thursday, but she still managed to acccessorize, including a pair of stud earrings and a bright white watch. 8. Grand Duchess Maria Teresa of Luxembourg wore pearls to an EU Foreign Affairs Council meeting in Luxembourg on Friday. 7. Crown Princess Victoria of Sweden (who recently announced that she's expecting a baby!) wore a sparkling earring and necklace set at AstraZeneca in Gothenburg on Thursday, along with a whimsical statement bracelet. 5. Queen Elizabeth II made her annual outing in the Braemar Feather Brooch at the Braemar Gathering in Scotland on Saturday. 4. Princess Anne wore a very appropriate golden horse brooch at Doncaster Racecourse on Wednesday, pairing it with other diamond and gold pieces. 3. Queen Maxima of the Netherlands arrived at a concert on Thursday in an ensemble that was quintessentially Maxima: a red jumpsuit and her long ruby and diamond pendant earrings. 2. On Saturday, Princess Charlene of Monaco debuted yet another new pair of earrings by Graff at the Princess Grace Awards Gala. This time, the pair is from the brand's Bomb collection; they're set with diamonds and rubies. 1. My top spot of the week goes to the groundbreaking monarch herself, Queen Elizabeth II. 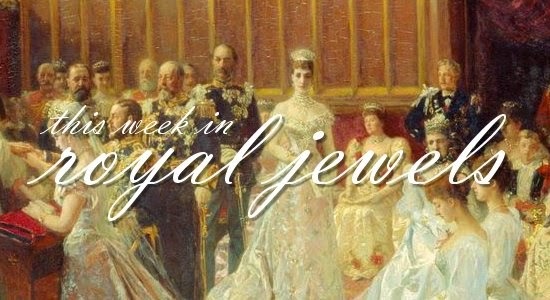 On Wednesday, she offered a nifty tribute to the monarch whose record she broke, Queen Victoria, by wearing one of Victoria's diamond bow brooches with her usual daytime pearls.